"Some like it hot" - Photo by Kris of Little Town in Hungary, a blog featuring daily photos "from Szentes, a small town located on the southern Great Plain of Hungary." I saw this scene yesterday. Does the owner of this flat like paprika so much? or it is a way to gain additional income? 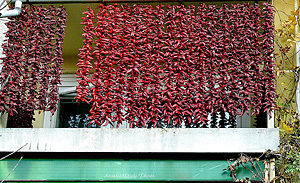 Whatever it is, the sure thing is, these wonderfully garland paprika (paprikafuzer) will ended up as the "ultimate spice" for many kitchens in Szentes. A beautiful image of a very old tradition.